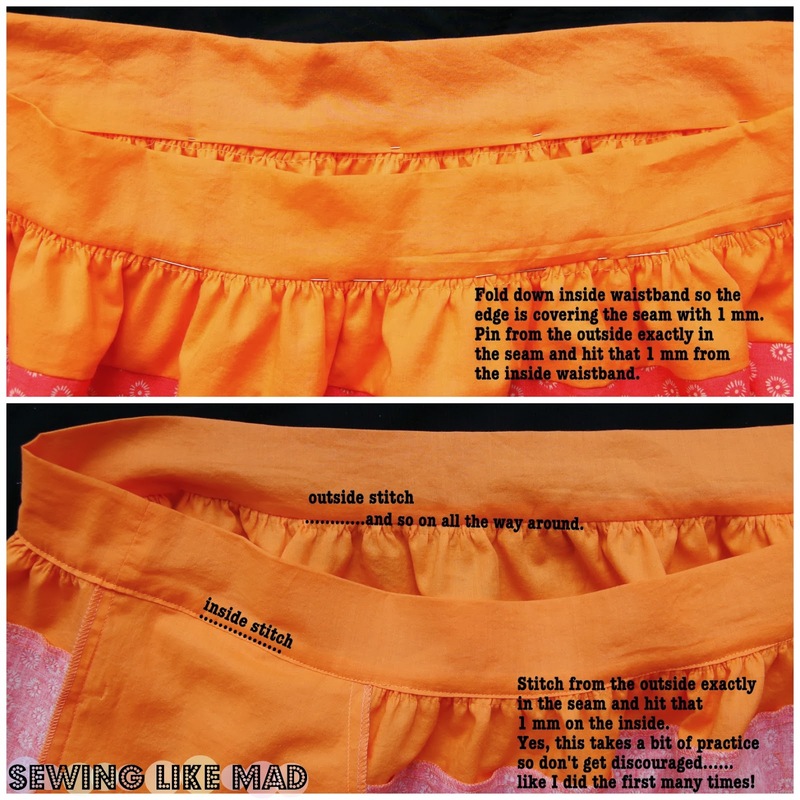 Sewing Like Mad: SONP 2013 - Elastic waist skirt with in-seam single welt pockets - TUTORIAL. 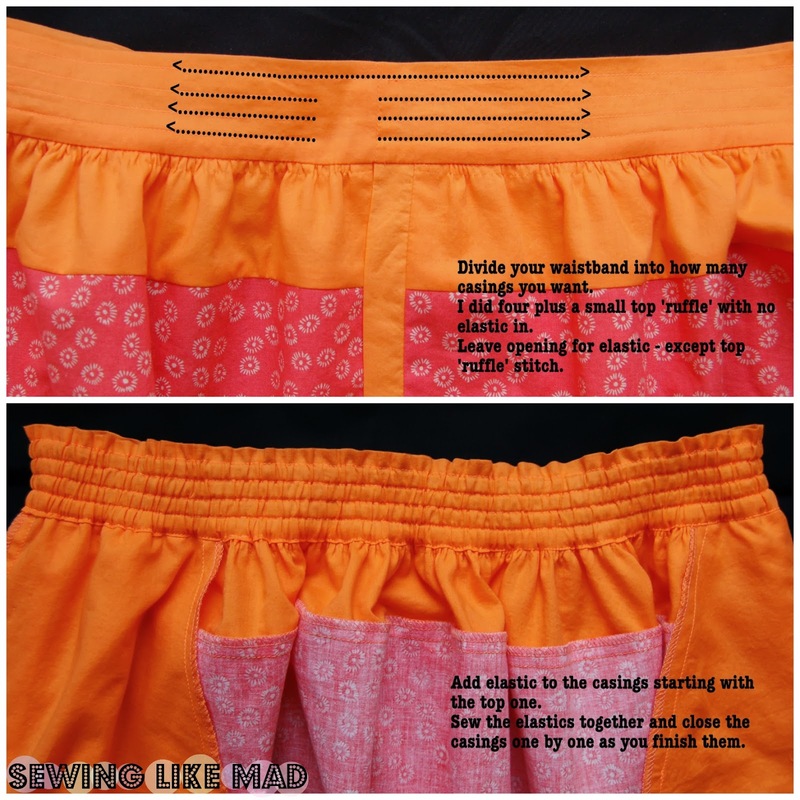 SONP 2013 - Elastic waist skirt with in-seam single welt pockets - TUTORIAL. Holy smokes do I have a tutorial for you guys today. 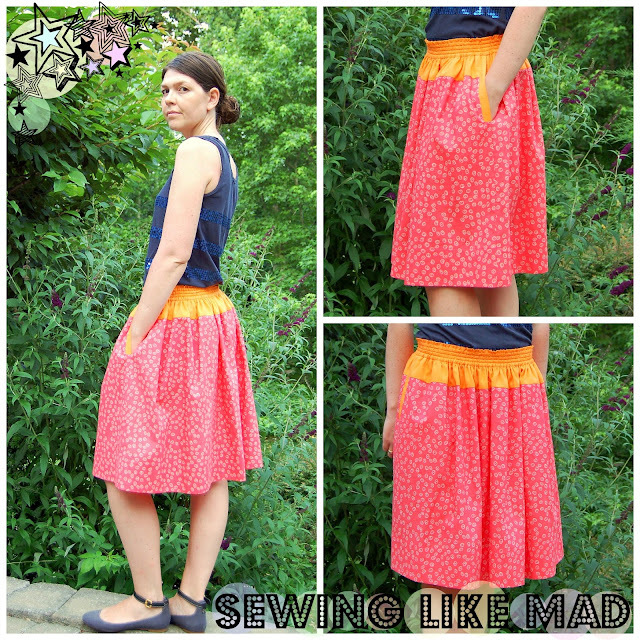 This is part of Summer of No Pants 2013 (SONP) on the great blog Hideous! Dreadful! Stinky! (yes I know, that name is hilarious! And since I had the pleasure of meeting Marigold (and how is that for a cool name by the way!) at Fabric Weekend, LA I can tell you she is exactly the opposite - beautiful, clever, funny....and not stinky at all, ha!) 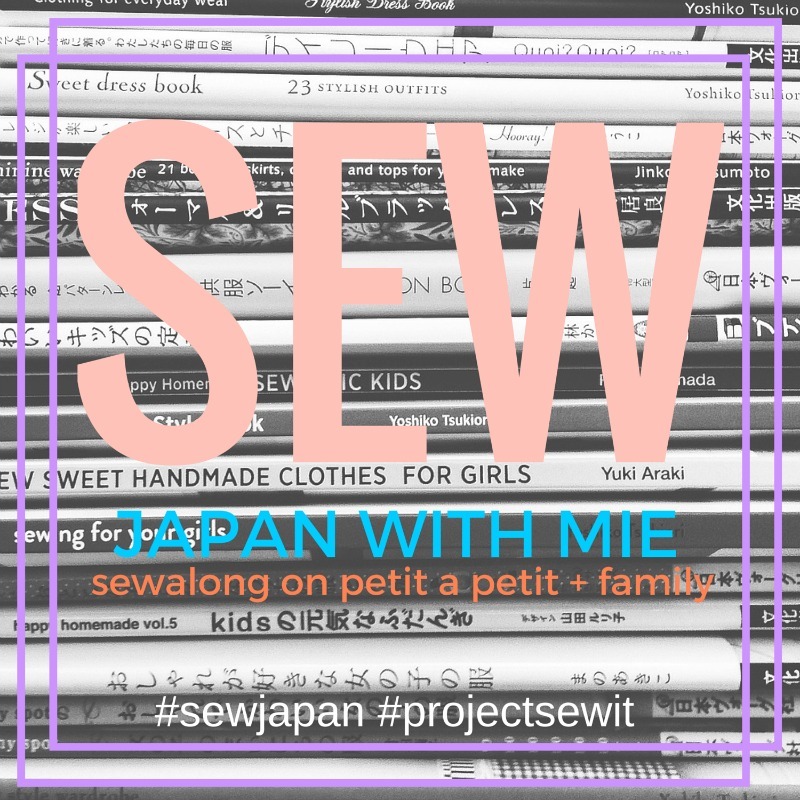 So if you are coming by from there....welcome to my blog! So what are we doing today you might ask? Well, around a year ago I made a pattern drafting tutorial to THESE elastic waist skirts with pockets and when I got the chance to do a tutorial for SONP I thought hmmmm, I have actually never made a sewing tutorial for that type of skirt. That changes today! Being the annoying person I am, of course I had to change something from the skirts I have already made. And I came up with this in-seam single welt pocket (yes, I have totally gotten help to that description - thanks Shannon!). 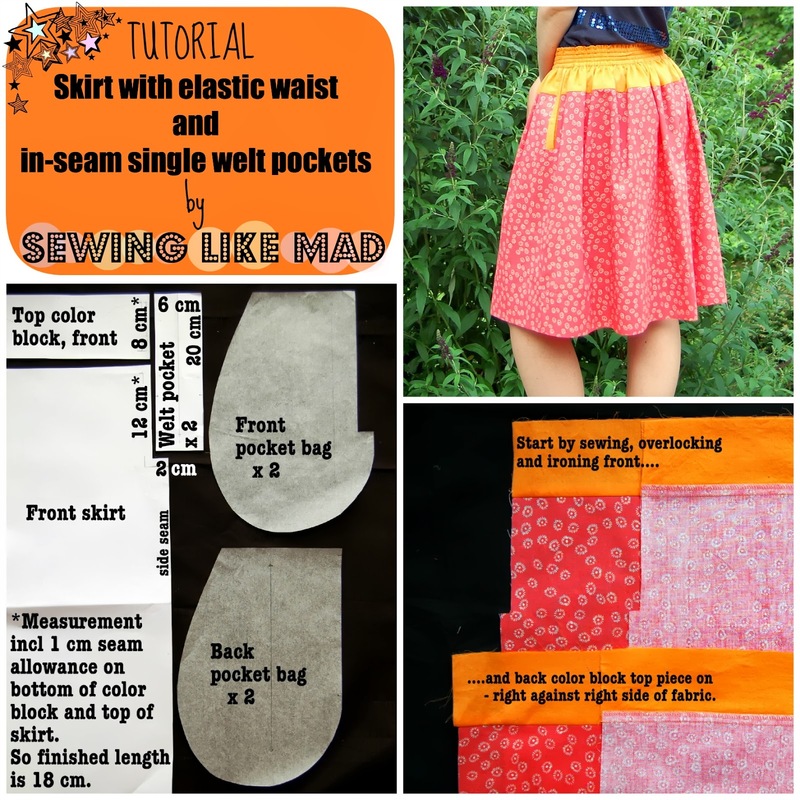 But the measurements from the pattern drafting tutorial are still working and I am giving you the info you need for these pockets in this post - I hope...otherwise please feel free to ask!! 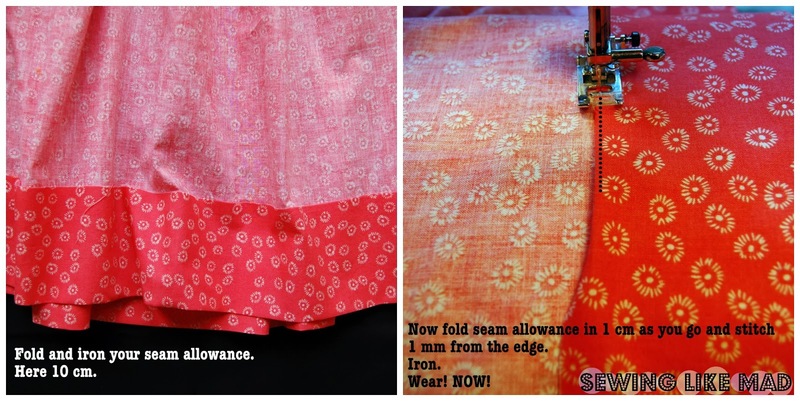 Let me first give you a short explanation to the magic change of fabric and colors along the photos in the tutorial...argh, I know!! 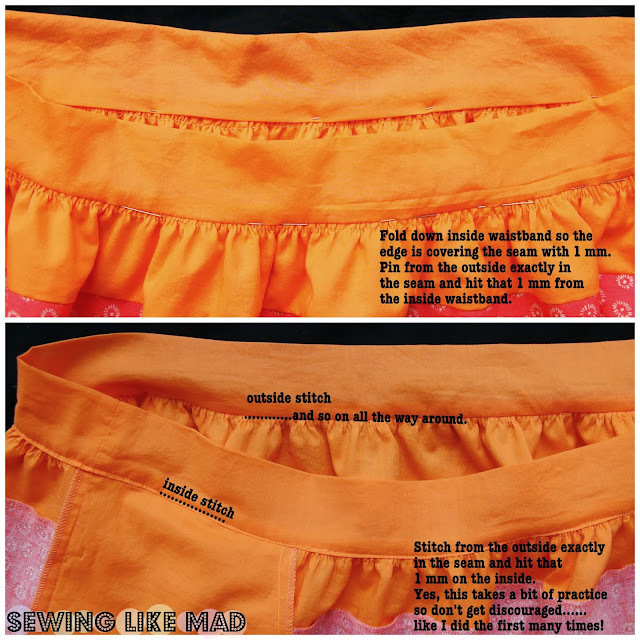 So I was sewing the orange and coral skirt and taking the photos for the tutorial along the way. 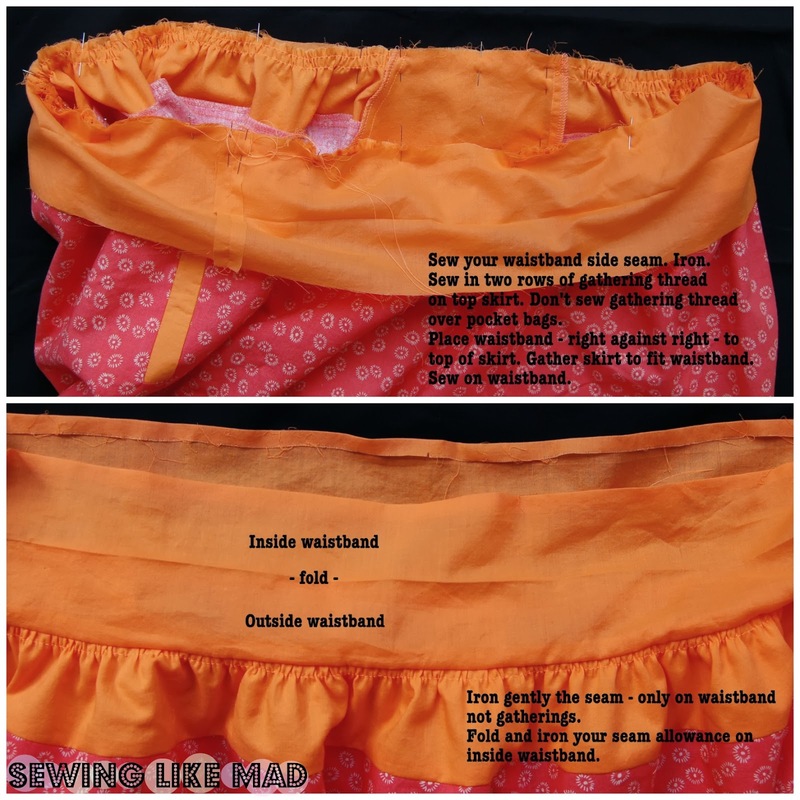 When I was done sewing I uploaded the photos and saw that the photos for sewing the single welt on the skirt - and this is for sure the hardest part of this skirt - does not work at all - grrrrrrrrrrr! SO what to do...well, the easiest solution for me, since I can't do graphic design, is to simply cut another skirt and photograph the steps I needed again. And this time I got what I needed. But there was no way I was going to make another skirt in the same two fabrics (I am not that crazy) and since this neon pink polka dot from Michael Levine had been calling on me since Fabric Weekend I decided to use that instead. You can see the other finished skirt HERE. So now that we are past the little bumps on the way let's get this tutorial started, shall we! 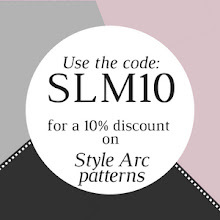 I am only showing you the pattern piece for the front skirt because the back skirt is exactly the same as the one showed on in the pattern drafting tutorial - except you have to cut of that top strip for the color block piece and add seam allowance (if you want the color block version of course). I am adding interlining to the 6 x 20 cm welt pocket pieces. I would for sure recommend you do that too so that the pocket openings holds up. After you put the interlining on then fold and iron the welt pocket pieces so they becomes 3 x 20 cm - right side out. And now I hope the photo collages should tell you the rest you need. I do have one small change that I only did on the neon pink dot version. Before sewing the side seams together on the waistband, I cut of 1 cm on each side of ONLY what then becomes the front waistband. That way the side seam and therefor also the pockets gets pushed a bit forward on your body and simply looks better when the skirt is worn. And now to the finished result worn by yours truly. That's all for me. Thanks Marigold for having me. These are some very cute skirts. The welt pocket detail make them something special! 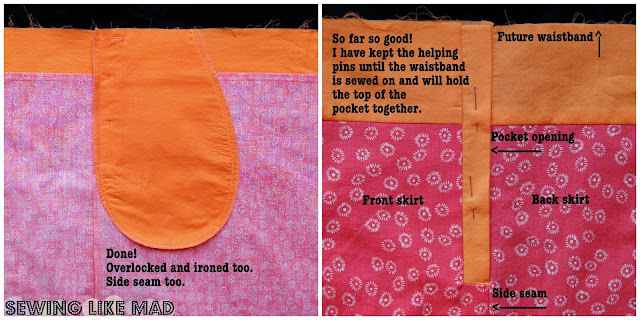 i just might be able to make one of those pockets...great tutorial! Your waistband stitching is divine! I haven't quite mastered that one, I end up top-stitching 1/8" above the ditch... Great skirt, great tutorial! Mie, this is an absolutely awesome tutorial! I love how the skirt looks on you. Now I can have one also! Thank you.... Thank you for linking it up at our linky party! Mie,this tutorial is really great! You are such an expert I have to try this. I have a Brora skirt similar to this - now I can make some of my own! Yey thanks for posting this great tutorial! 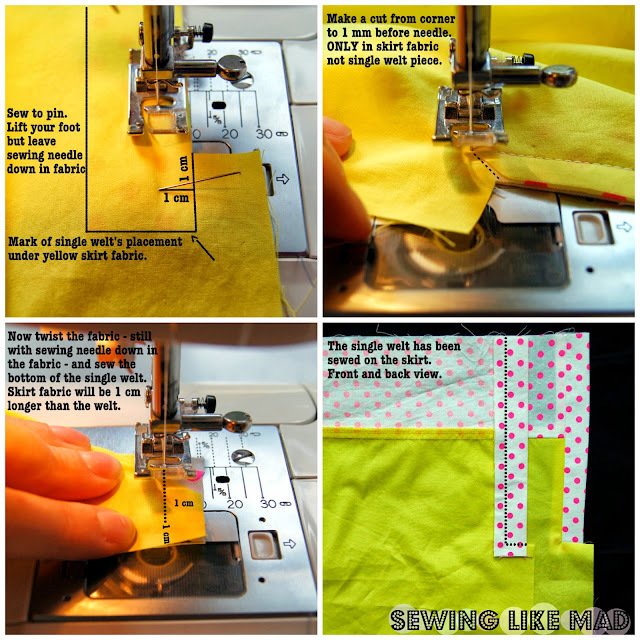 Pinning it now to my Stitching and Sewing board :-D Thanks for sharing! 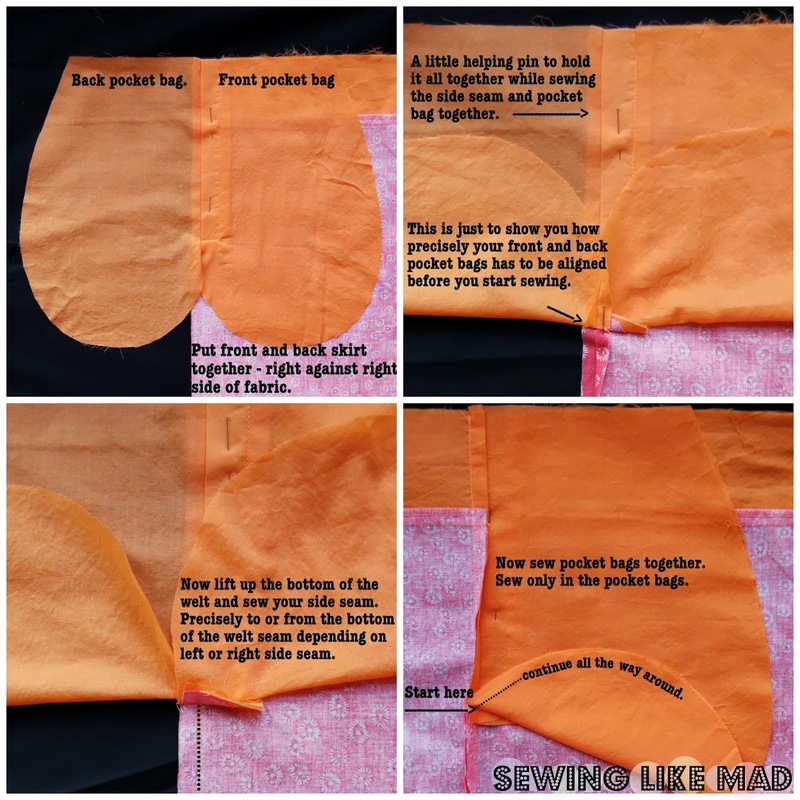 Thanks to this tutorial I was able how to figure out how to place my welt pockets, thanks! Fabric Weekend 2013 - Los Angeles + GIVEAWAY.